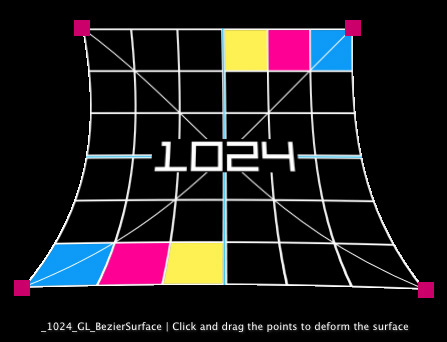 Xmas time comes this year with a nasty storm of QCplugins, here’s is _1024_GL_BezierSurface, a 4×4 control points smooth surface, that should allow any visualist to project onto curved surfaces, such a cyclos. The plug definitely needs some more polishing, but should do the job anyway. The texture is currently rotated and flipped, so adding an Image Texturing Properties patch to your input image will trick the plugin. If you’re annoyed by the nasty aliasing at the edges, I would recommend compositing a 1pixel black border to the input image. Still looking for an elegant solution. EDIT: just added a 1.02 version that fixes a nasty bug, and also adds a SoftRec CIkernel for sweet anti-aliased borders, as pointed by GT in the comments. Sorry to all early downloaders. 10.5/10.6, sample file included, download from the box.